If growing up in this world was ever simple, it certainly isn't anymore. From stranger danger and violence to health problems and learning difficulties, our children face so many mountains every day and rarely is there a clear cut solution without a wounding side effect. Today's review is over something that makes me so thankful to be a member of the crew and glad to have such a huge educational resource through my relationship with it. 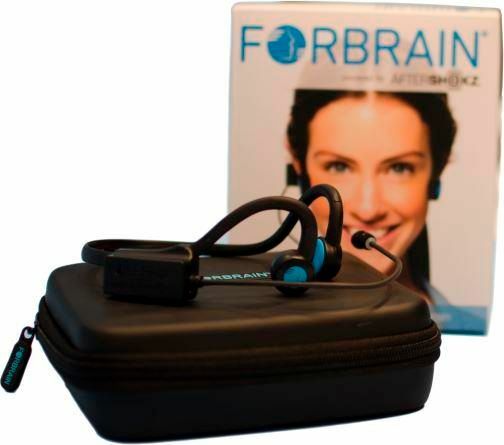 Forbrain from A Sound for Life LTD is a headset that uses your voice to enhance your brain. Using Bone Conduction, it transmits the sound of your voice faster and clearer. Then a dynamic filter enhances specific frequencies of speech and constantly surprises the brain. It is has been used for things such as auditory processing, sensory integration, speech issues, and short-term memory help. When you are in the business of educating young minds, it is likely that you have at least one student that could benefit in one or more of these areas. In recent months, my brother and sister-in-law had been investigating ADD and various methods for addressing related issues for my nephew. When this product came up for review, I immediately thought of them because all of the skills Forbrain is advertised to help with can be traced back to ADD issues. They had recently started a new regiment of dietary changes and various exercises designed to help balance certain things in the brain. Trying Forbrain fell right in step with the new things they were trying. The one disadvantage of that is that some of the progress they've experienced is hard to trace back to a single change they've made, like the use of Forbrain, but they did make some interesting discoveries anyway. The main user was to be a 7 year old suffers from focus and attention issues. They found it to be easy for him to use by himself on a daily basis. He would read books aloud to himself for 15-20 minutes at a time. They also had him count aloud alternating from a soft to loud voice for each number. They have seen some improvements in some of his problem areas, but again it is difficult to say what has made the most impact. More time with the product may produce more specific results. One frustration is the size isn't adjustable so it feels large on a child's head. That may be necessary for it to work properly, but it takes some getting used to. Still, the kids enjoy using it and making silly sounds! Because little sisters always want to do what their big brothers are doing, another user was a 3 year old. At her age, her language and clarity is still developing so Forbrain made a very clear difference immediately even though she only used it a few times. Each time she used it she would talk more slowly and deliberately, correcting herself when she would hear a word spoken incorrectly. It quickly helped her to say her ‘L’ sounds more correctly. Based on this limited experience, Forbrain is a high-quality resource certainly for anyone with language or speaking difficulties. Those difficulties certainly impact other issues so it makes sense that this tool could have farther reaching effects with long-term use. When learning challenges come with our children, one of the most life-giving things is just knowing about different resources that might could help. This gives us hope for growth and improvement! Our experience was limited to our family's needs and challenges. Follow this link to read how other people used this product and what types of results they had.